Historic Kennebunkport – See the Trolley Museum! Kennebunkport is a special place to visit for a lot of reasons. The wealth of historical things to see and do in the area is one of them. One of our favorite places to explore is just down the road from the Inn and a huge hit with guests from around the globe. The Seashore Trolley Museum opened in 1939 and as well as being the oldest, it is also the largest electric railway museum in the world. When you visit, plan to spend a few hours, or the day, exploring the 330 acre campus. Their collection currently contains more than 250 trolleys and transit vehicles from around the world. In addition to viewing the streetcars, the Library of the New England Electric Railway Historical Society is also housed there. This collection include postcards, magazines, photos and books that have been donated by individuals over the years. Trolleys have played a big role in the history of Kennebunkport with the first trolley service going back more than 100 years. The Mousam River Railroad began operating in 1893 as a two mile line between Sanford and Springvale, Maine just west of Kennebunkport. It’s original purpose was to haul coal and raw materials to power the mills. 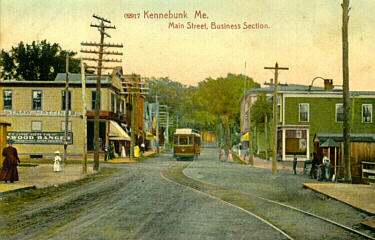 The original trolley line was extended in 1899 to run the 20 miles from Sanford to Kennebunkport’s Cape Porpoise port. They also added a passenger trolley service to the area and the Sanford & Cape Porpoise Railway was born. Both railways were combined in 1904 to create the Atlantic Shore Line Railway which subsequently became one of the largest electric railways in the state of Maine, providing service to the southern Maine seacoast from York and Kittery to Kennebunkport, crossing through what is now the Seashore Trolley Museum, and ending in Biddeford. The Museum’s Visitor Center hosts a gallery exhibiting “History in Motion: Public Transportation Connecting Maine Communities”. The exhibit is a great walk through the history of how trolleys impacted on the lives of people living in Maine. Indeed, it is the electric railway system that had one of the most significant impacts on this region’s economic growth and development as a vacation and resort spot. The Museum is open 7 days a week from May 2, 2015 – October 25, 2015, 10:00am to 5:00pm. They hold several special events throughout the season including Father’s Day (June 21st), Founders Day (July 4th) and the Pumpkin Patch Trolley (September 19th & 20th, and 26th & 27th). Their annual Seashore Trolley Speakeasy is not to be missed if you find yourself in Kennebunkport August 21st. The theme this year is Chicago Gangster where you can treat yourself to some of Al Capone’s favorite foods while dancing under the big tent to Prohibition era music blues and jazz. Don’t fret – dance instruction available for those who don’t know the steps! Tickets must be purchased online and sell out fast! Stop in and spend some time riding the old trolley’s and visiting the history that this wonderful museum has to share! This entry was posted in Historic Kennebunkport by admin. Bookmark the permalink.